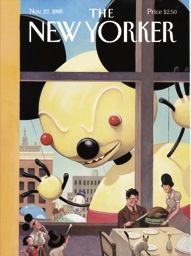 Something you don’t see too often: science fiction in the New Yorker magazine. Take the time to listen to this reading of Stuart Dybeck’s “The Red Lantern.” It takes a master to write about adultery this beautifully. This has just a minimal amount of science fiction in the set-up to give it that special ingredient. You can hear the story, and some interesting follow-up commentary, at the New Yorker.